The novel Sun-Synchronous Orbit-A mission (SSO-A) successfully completed on December 3 last year relied significantly on error-free operation of an extensive suite of avionics supplied by Ecliptic Enterprises Corporation. Conceived in 2015 by Spaceflight, SSO-A was the first fully dedicated rideshare mission, where 64 smallsats were integrated onto a single large launch vehicle (a SpaceX Falcon 9) via a modular stack of support structure, launched into LEO and then separately deployed from the support structure to become independent Earth-orbiting satellites. This mission set a new U.S. record for the most satellites launched by a single launch vehicle: 64. Once reaching orbit, avionics on the Falcon 9 rocket’s upper stage initiated six deployment events: separation of a large module called the Upper Free-Flyer (UFF), separation of a smaller module called the Lower Free-Flyer (LFF) and the release of four smallsats that were attached to a structural module that remained with the second stage. Twenty smallsats were from the UFF and and 40 from the LFF. 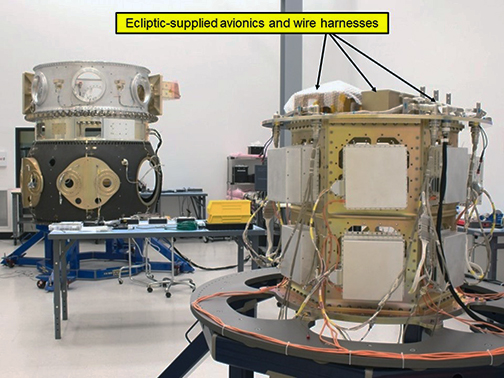 Ecliptic’s avionics interfaced with five different separation system designs from four different vendors. 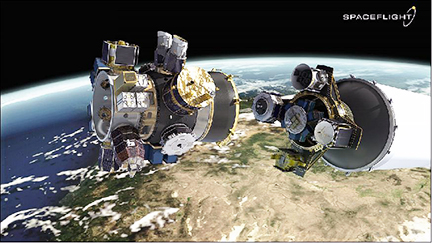 Artistic rendition of Spaceflight's SSO-A mission. Ecliptic began its contract with Spaceflight more than two years before the launch, stepping through requirements-definition and design phases, build-up of development model test versions of the system, and finally build-up and environmental testing of the flight units. As part of the overall effort, Ecliptic opened a new wiring harness lab and for over a year and a half designed, fabricated and tested over two miles of test and flight harnesses. Spaceflight’s SSO-A Mission Director, Jeff Roberts, noted that Ecliptic’s products and services were the key to mission success and he commended the firm for their support of the mission. Ecliptic’s COO and project manager for this project, Riki Munakata, said that, programmatically and technically, this was a highly challenging effort. The hardware, software and harnessing designs had to be flexible enough to deal with many changes in the SSO-A payload manifest during the course of the contract, and the company knew that the overall operation ultimately had to be flawless for the mission to succeed 100 percent.